Can’t make it to EFM today but still looking for a quick fitness fix? 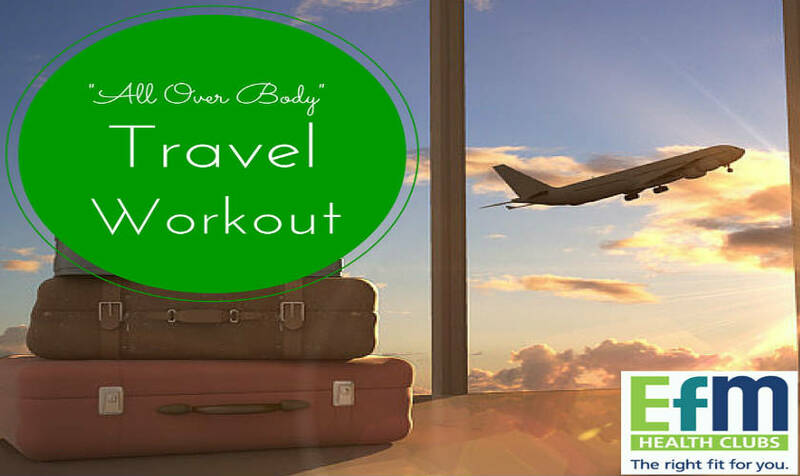 Are you travelling for work or holidays and want to maintain your workout consistency? Try our “All Over body” Travel workout! 6 tips for completing this short, sharp and shiny program. 1. Warm up – remember to focus on the muscle groups you will be using in the session. 3. Make sure weights are balanced, safe, and that you’re using correct technique and appropriate resistance. 4. Adjust times to suit your total available workout time. 5. Work through, in order, from top to bottom. 6. Interval training activity can be a jog or brisk walk if no cardio equipment is available. The information and content of this website is of a general nature only and does not constitute advice to you. By accessing this website, you agree that: (1) you do not rely on the information and content of this website and (2) you will seek personalised medical, nutritional and/ or fitness advice applicable to your circumstances (as appropriate).